everything together almost ready to install just gana paint the calipers and brackets then they will be going in. To do a 1 piece ss hose with a banjo fitting one end and the female IF on the other, would be right around $100 for the pair. To do a 3 piece hose, which is a 10mm banjo x -3an fitting(piece 1), custom 21" long -3an hose with 1 end having a 45* angle (piece 2), and a female IF x -3an fitting (piece 3), they would be $75 for the pair. Here is a parts list for the 3 piece hose from Jegs. Its all Russell brand where I have access to and would provide XRP fittings. This says about the braided lines I don't mine not having braided. I looked it up on a parts site and they both have three 10mm x 1 female side so I think it'll work but not sure just figured I would ask. You will need the saturn rubber lines. They attach directly to the jbody hard lines and have the banjo fitting to go on the caliper. Its pretty straight forward. You can shorten and re flare the hard lines to fit better if you wish. Cool thanx that's what I was wondering. I believe, that somewhere in this thread Kardain posted all the part numbers for every fitting, and all braided lines you'd need to replace from the stock J hardline to the caliper, just dig through to find it. Dsmskyline sold the kits, the part numbers are in his thread too. Yet again that is for replacing with beaded lines which is not what I'm doing. I was asking if the stock lines for both would work together. Thanx though. r any brackets still available?? One set of 3/8" brackets are available. You....You and You............. panic...the rest of you ..... COME WITH ME!!! I'm actually printing the rest of the labels now. I will be sending out tracking numbers later today, and dropping the boxes at the PO tomorrow. Got my brackets but won't have the time to install for a little bit. They look awesome and will definitely be in for a bracket to make the fronts bigger. I got my tracking number...... Sweet! ...and will definitely be in for a bracket to make the fronts bigger. Haven't set up the machining yet. Hoping to do so over the next couple of weeks. Updates will be posted in the suspension & brake forum. New spindles to hold what calipers? My interest is peaked but I will wait for the post in the suspension forum. Just a thought guys... I recently did the independent rear suspension swap and I plan on doing the w-body front swap so I have the 5x115 bolt patter all the way around, an with this setup ill be able to run corvette rotors, why not just do this swap instead of machining a me bracket? 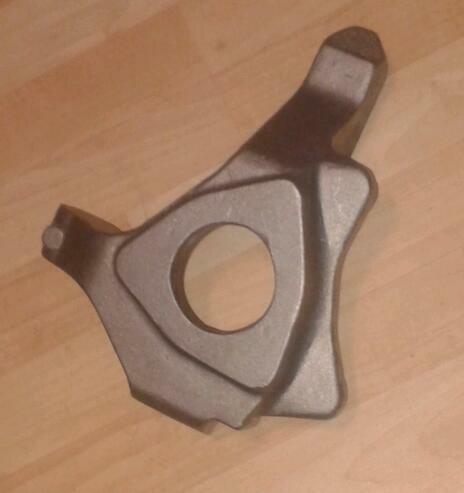 There will be more than one option on calipers and rotors with the spindles, some of them being very light weight. Some people don't want to do the IRS swap, but want aluminum knuckles and/or the big brake upgrade. OK, enough of the thread jacking. The knuckles will be posted in the suspension & brake forum as I make progress. Damn man u don't play around when it comes to this brakes shyt, I gotta get on tha ball n get a set of rear brackets from ya asap, KEEP BRINGIN IT FELLA!! !